Anyone try building a tweet-a-watt with a Kill-A-Watt EZ? It uses the same quad op-amp as the standard unit (P4400? ), but even with the 10,000uf capacitor it "resets" every time the XBee tries to broadcast (every second or two). Is it possible that the 5V supply on this smaller unit isn't able to handle the surge? I haven't put a scope on it so I'm just assuming. Have you tried increasing sleep period of the transmitter? Even though the maximum is 2.56sec, which is not very much longer than 2sec in the default configuration, it may help. It's hard to say anything without seeing the circuit dynamics, but you can also put a resistor in series with tank capacitor restricting current into it. Another option would be to move up to Series 2 Xbees; the maximum cyclic sleep time for those is several days. They also consume less in End device configuration. Well, setting the XBee interval to 2.56 seconds didn't make any difference. It still "resets" every time transmission occurs. The general consensus is that the power supply in the EZ just can't handle the increased load of the XBee, even *with* the big cap in place. 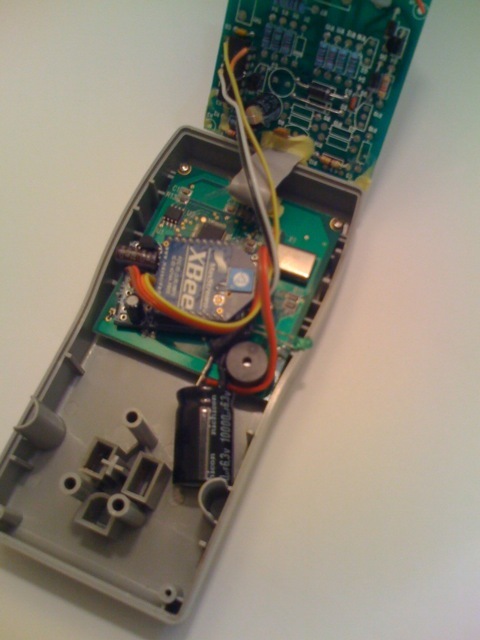 Re-wired the transmitter into a standard Kill-A-Watt (P4400) and it worked just fine. There is another option: if your receiver is not too far away, you can lower the transmitter power. It's set to the max. by default. Seeing as I had bought 4 of these "Kill-A-Watt EZ"s from Costco, I decided on the trial and error approach and tried another unit. I wired in the XBee into a different EZ and it worked! No resetting. No oddball behavior. It just worked. In fact it's been logging data on powerstrip providing power to the server and other electronics in my office for the past couple of days. I'm not sure what the problem with the *first* Kill-A-Watt EZ was, it seems to function fine on its own but doesn't like having the radio attached (yes, it was wired in correctly). I'm going to order a couple more XBees and if I get curious I'll try it again. I'll post some pictures of the physical layout of the components in this smaller unit. The LED had to poke out the side not the top, and the adaptor board was stuck to the main board with a piece of double sided foam sticky tape. ya photos would help other people. thanks! This shows the general placement of the components. The XBee breakout board itself got stuck to the main Kill-A-Watt board with two layers of double sided foam sticky tape. 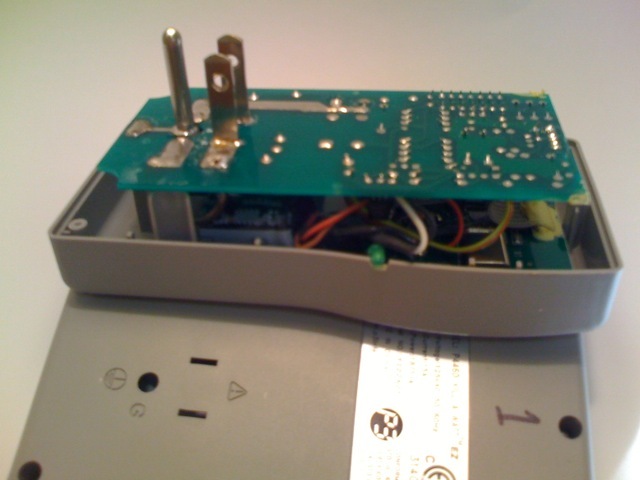 Here you can see a different angle showing the placement of the super-cap and wiring. With the sensor board placed back on top, you can see the snug fit of the components. A simple notch in the "seam" was all that was needed to let the LED poke out. 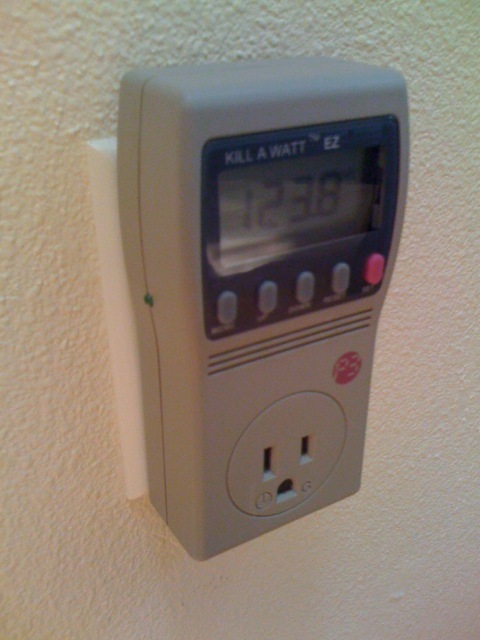 Would it work also with EU compatible plug meters, for example this one (http://www.prodigit.com/index.php?lang= ... o_num=1051)? bozo wrote: Would it work also with EU compatible plug meters, for example this one (http://www.prodigit.com/index.php?lang= ... o_num=1051)? I just received mine, the UK version. After some initial problems looking around for the chip I finally found it behind the LCD panel. 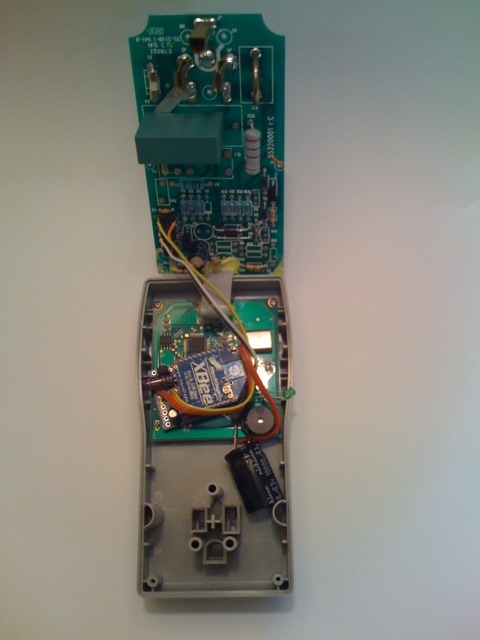 The Op-Amp located behind the LCD of the UK version.